The town of Surajgarh in the Shekhawati region of Rajasthan derives its name from the 18th century fortified Palace SURAJGARH. The name literally means “The Castle of The Sun”. This 4 acre fortified palace is being lovingly restored to give our guests the experience of living like a Maharaja. Established in 1780 by Shekhawat Suraj Mal, ruler of the Jhunjhunu thikana, the township of Surajgarh came up with the construction of the fort, for the construction of the fort not only offered employment to the people from the neighboring villages, but after its completion also offered a safe sanctuary from marauding bandits and invading armies. The frescoes for which Surajgarh and Shekhawati are famous owe their existence to the many travelers who came through this region, bringing along with them stories of the lands far away, the local populace started to decorate their homes with frescoes of the tales told by the travelers and from scenes from the Bhagvad Gita, Ramayana and Mahabharata. The materials used for painting the frescoes were crushed cowrie shells, lime and vegetable dyes which were produced locally. The cowrie shells were used as currency at one time, but since the chipped and broken shells had no value, they were crushed to produce a water resistant base for the frescoes. 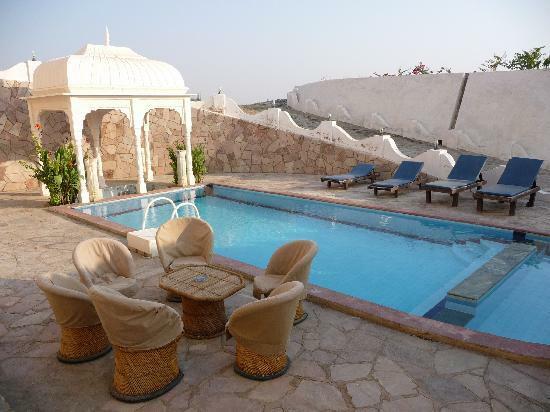 If you have not decided yet or wants to customize tour itinerary or hotels listed above in "Surajgarh Fort, Rajasthan Christmas & New Year 2011 Package Rs.12000/-", then we can change the travel itinerary and make a personalized, tailor-made holiday package, especially for you. We can modify this travel package as per your itinerary, budget, duration and the tourist places you would like to visit, including transportation and airfare should be included or not. Please fill the form below to contact us.